PCB stack-up is an important factor in determining the EMC performance of a product. A good stack-up can be very effective in reducing radiation from the loops on the PCB , as well as the cables attached to the board. On the other hand a poor stack-up can increase the radiation from both of these mechanisms considerably. 4. The spacing between the layers. 4. The EMC engineering expertise of the design team. You don't need to spend your time by designing stackup. Leave it on PCB manufacturer – they are professionals. They do it every day. Also, by doing it this way, you can work on design in parallel of handling issues with PCB stackup. Many times PCB manufacturer is not able to build PCB stackup designed by other company or a person outside their company. The main reason is unavailability of material used in some PCB stackups. Selection of material is the best to leave on them – they will choose stocked material. PCB manufacturers use different track geometry calculators and they will not guarantee track impedance if track geometry is calculated by someone else. Many times their calculated numbers and your calculated numbers will be different. Standard core thickness: 0.15mm, 0.20mm, 0.36mm, 0.46mm, 0.56mm, 0.71mm, 1mm, 1.2mm, 1.5mm, 2.0mm, 2.4mm, 3.2mm. Core is supplied with copper foil on both sides. For some cores you need to add copper foil thickness (18um or 35um) to the core thickness. There are some rules how to build your stackup. Not every combination is possible. Check it out with your PCB manufacturer. Track width: 11mil / Copper foil 18um (0.7mil) / Track Gap 8 mil / Dielectric thickness. The stackups pictured are our "typical" stackups for the layer count and finished thicknesses noted. However, these stackups are not "Guaranteed" unless you so specify in your files used when placing your order. We process four layer boards with final thickness of 0.020", 0.031", 0.040", 0.047", 0.062", 0.093" and 0.125". You may select ½, 1 or 2 ounce inner layer copper foil for your board. While our 4, 6, and 8 layer boards are limited to 16X22 inches the 10 layer maximum size is 14x20. We have several inner layer cores available using Isola's FR406 materials - they include 5, 8, 10, 14, 18, 21, 28, 35, 39, 59 and 93 mil cores. -Six layer boards are produced in thickness of 0.031", 0.040", 0.047", 0.062", 0.093" and 0.125" with the same inner layer foil options. -Both our eight and ten layer boards are available in finished thickness of 0.062", 0.093" and 0.125". The stackups pictured are our "typical" stackups for the layer count and finished thicknesses noted. However, these stackups are not "Guaranteed" unless you so specify in your files used when placing your order. Additionally, for these or any specific stackup that you require, be sure to order as "Custom" and select "Controlled Dielectric." While our 4 and 6 layer boards are limited to 16X22 inches the 8 layer is 12x18 and 10 layer maximum size is 10x16. We have several inner layer cores available using Isola's FR406 materials - they include 5, 8, 9.5, 14, 18, 21, 28, 35, 39, 47, 59 and 93 mil cores. -Both our eight and ten layer printed circuit boards are available in finished thickness of 0.062", 0.093" and 0.125". ETAG Circuits builds Single-Sided through 10 layer prototype . You can use one of our "standard" dielectric builds or specify your own controlled stack-up. We process four layer boards with final thickness of 0.020", 0.031", 0.040", 0.047", 0.062", 0.093" and 0.125". You may select ½, 1 or 2 ounce inner layer copper foil for your board. 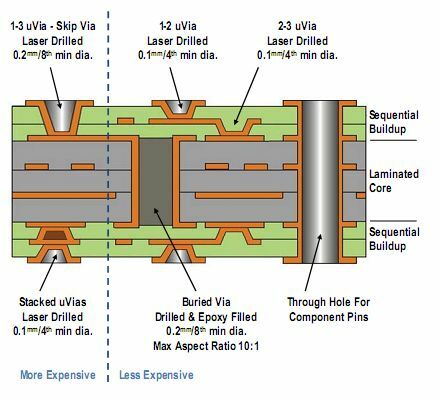 We have several inner layer cores available using Isola's FR406 materials – they include 5, 8, 9.5, 14, 18, 21, 28, 35, 39, 47, 59 and 93 mil cores. Six layer boards are produced in thickness of 0.031", 0.040", 0.047", 0.062", 0.093" and 0.125" with the same inner layer foil options. Both our eight and ten layer boards are available in finished thickness of 0.062", 0.093" and 0.125". ETAG Circuits can supply you with a RoHS compliant multi-layer board using laminate materials that can be matched up with the exposure to high temperatures during your assembly processes. It is important to keep in mind that some lead free assembly processes will require the laminate base material to withstand temperatures in excess of 260 degrees C or 500 degrees F for extended periods of time. To resolve this, we have high temperature laminates in our inventory so that our customers will be able to meet the higher temperature cycling requirements of assembly applications. In high temperature materials we currently stock Isola's 370HR in cores of 8, 10, 14, 22 and 39 mils. ETAG Circuits has UL approval for processing high thermal capacity materials manufactured by Isola and Nelco among others in producing your multi-layer board. These materials met the UL testing for 130°C maximum operating temperature. Each of these laminate systems meets the minimum requirements of IPC 4101B. Individual manufacturer's material types may exhibit variations in electrical, thermal and physical properties. Normally a single manufacturer's material will be stocked for use. If you have specific questions please contact your ETAG Circuits sales representative. ETAG Circuits builds Single-Sided through 10 layer prototype and production circuit boards. You can use one of our "standard" dielectric builds or specify your own controlled stack-up. We process four layer boards with final thickness of 0.020", 0.031", 0.040", 0.047", 0.062", 0.093" and 0.125". You may select ½, 1 or 2 ounce inner layer copper foil for your board. ETAG Circuits can supply you with a RoHS compliant multi-layer board using laminate materials that can be matched up with the exposure to high temperatures during your assembly processes. It is important to keep in mind that some lead free assembly processes will require the laminate base material to withstand temperatures in excess of 260 degrees C or 500 degrees F for extended periods of time. To resolve this, we have high temperature laminates in our inventory so that our customers will be able to meet the higher temperature cycling requirements of some lead free assembly applications. Impedance is the sum of the resistance and reactance of an electrical circuit expressed in Ohms. The resistance being the opposition to current flow present in all materials. The reactance is the opposition to current flow resulting from the effect of the inherent capacitance and inductance of the conductor interacting with changes in voltage and current. In DC circuits there is no reactance and the resistance of copper conductors is typically insignificant. However in high speed AC circuits (those with sharp changes in voltage and/or current) the reactance and thus the impedance can become very significant. This can become critical to a design's functionality because of the effects that changes in the impedance along the signals path from transmitter to receiver will have on the efficiency of power transfer as well as signal integrity. While a circuit's speed is often expressed as the frequency of the wave form: the critical concern is the speed at which the voltage and/or current is required to change. The typical design considerations involved in the determination of the requirement for controlling the impedance are the strength of the signals involved, the susceptibility of the circuit to noise and signal distortion, the criticality of signal timing and the speed at which the signal's source is attempting to force a change in voltage and/or current. The design considerations for setting the value of the impedance for the conductor is typically the output impedance of the transmitter and the input impedance of the receiver. The impedance of other conductors (i.e. coaxial cables) in the circuit path will also need to be considered. The acceptable range (tolerance) for the impedance will need to be determined and taken into account during the design phase as well as when specifying the PCB parameters. In many cases merely by using software models to determine the anticipated impedance with particular dielectric materials. This is what we call "controlled dielectric". For more critical applications you will need to specify "controlled impedance" and supply the actual impedance requirements for the conductors . The impedance requirements will have to be specified based on the layer and the conductor widths.